When Hirut Yohannes Darare opened her dairy processing company, she aimed not only to provide for her family, but also to improve the lives of dairy farmers in her community and across Ethiopia. “When I was growing up, every day my father brought me milk to drink. Because of this I can work as I like. I can run. I am healthy. So, when I saw that there was a shortage of milk in Ethiopia, I chose to enter into dairy,” said Hirut Yohannes Darare, founder and general manager of Rut & Hirut Milk Cows Breeding & Dairy Production & Processing PLC, a dairy processing company located in Chacha, Ethiopia. Hirut’s company sources from over 450 local dairy farmers, 95 percent of whom are women. After 17 years working for the Ethiopian government, Hirut suddenly found herself unemployed following a change in administration. 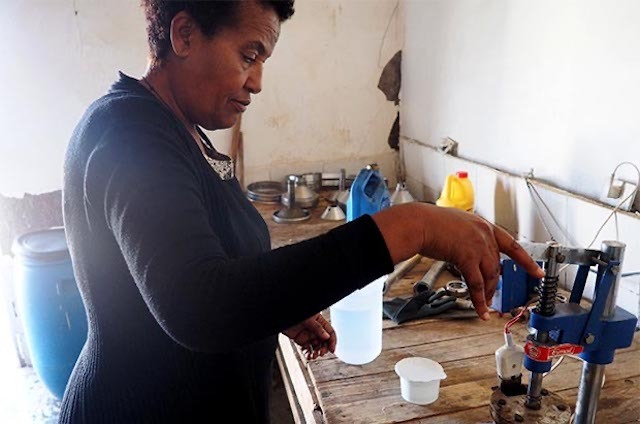 To sustain her family, she sold vegetables to women in government offices in Addis Ababa, eventually making enough income to purchase a small piece of land and two cows from which she started her dairy business. In addition to her own farm, Hirut began sourcing milk from a handful of her neighbors and distributing it in local markets. 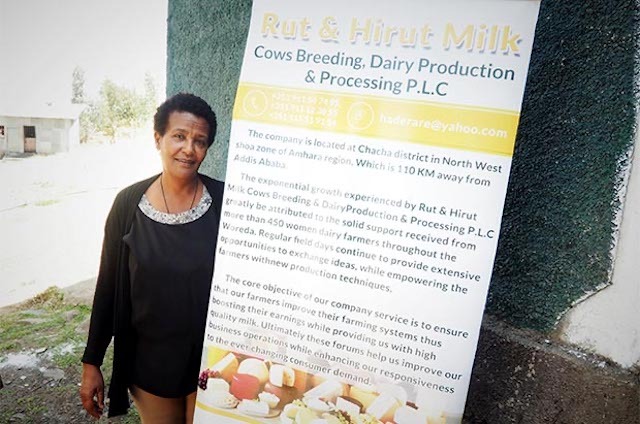 When she realized that her cost of production outweighed her revenue, Hirut sought out training opportunities to increase the productivity of her cows and the quality of the milk they produced. After receiving training in cattle and feed management from Land O’Lakes and the U.S. Agency for International Development (USAID), Hirut began sharing her new knowledge with the farmers who supplied her with raw milk, helping them to improve their production. As Hirut conducted trainings at farmers’ homes, she couldn’t help but notice that the burden of labor fell almost entirely on women. She said, “The woman cleans the cow, she milks it, she carries the milk to sell and she takes the cow for grazing. All of the work is done by the woman,” she said. That is why when Hirut officially established Rut & Hirut in 2008, she did it with the goal of improving the lives of farmers, particularly female dairy farmers. Rut & Hirut officially established a dairy processing plant in August 2013 after purchasing processing machinery with the potential to process 6,000 liters of milk per day. Today, Rut & Hirut produces a wide variety of dairy products, including pasteurized milk, 16 types of cheeses, three flavors of yogurt, and three types of butter and cream. Despite its immense growth early on, Rut & Hirut struggled to reach maximum production potential due to a lack of knowledge surrounding production techniques and basic food safety requirements, resulting in poor hygiene around the processing plant which impacted the quality of the final products. Improper handling and storage of cheese after production resulted in a 10 percent loss daily ($66). Rut & Hirut was also plagued by mechanical challenges, such as missing equipment parts that prevented the processor from using the yogurt processing line in its entirety. 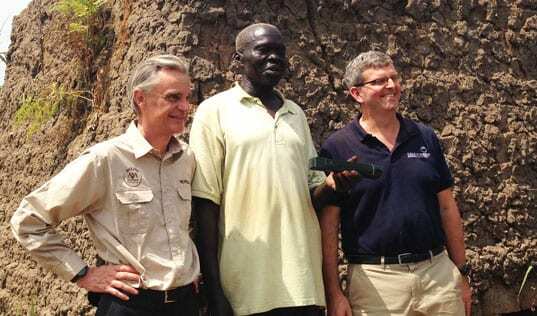 In 2015, Rut & Hirut joined Solutions for African Food Enterprises (SAFE), a TechnoServe program in partnership with USAID and Partners in Food Solutions, with the aims of increasing the competitiveness of the African food processing sector and expanding the availability of affordable and nutritious foods. Partners in Food Solutions (PFS) is a nonprofit organization formed by General Mills to share the technical and business expertise of volunteer employees from General Mills, Cargill, Royal DSM, Bühler, The Hershey Company and Ardent Mills. 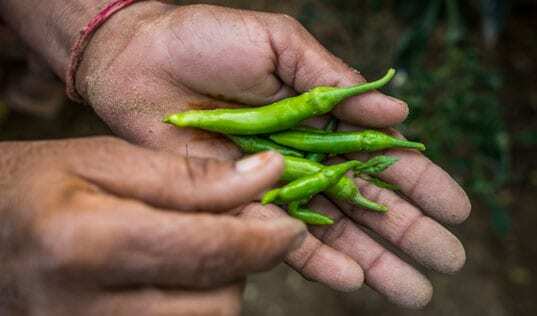 This program provides knowledge and technology transfer to build the capacity of African food processors, improving availability of nutritious foods and creating market opportunities for smallholder farmers. As part of the SAFE program, TechnoServe and PFS developed good manufacturing practices (GMP) manuals and provided training to Rut & Hirut staff to ensure that the processor operates within environmental conditions favorable to the production of safe food. 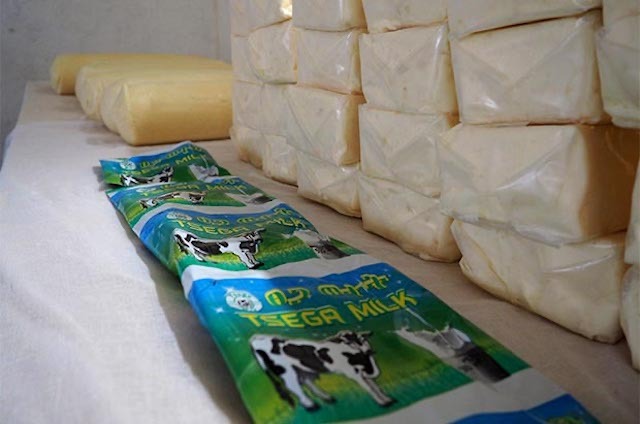 And since Rut & Hirut transports the majority of its dairy products over 65 miles to sell in its three shops in Addis Ababa, the SAFE team conducted an analysis on how to prevent spoilage and improve the shelf life of their milk. As a result, volunteer experts in quality and new product development from General Mills advised on the importance of chilling milk during transport. Rut & Hirut began chilling their milk immediately after pasteurization until it froze and could endure the journey to Addis Ababa. When Rut & Hirut purchased new dairy processing machinery, the yogurt processing line did not come with a manual and had mechanical issues that prevented the processor from utilizing it for three years. 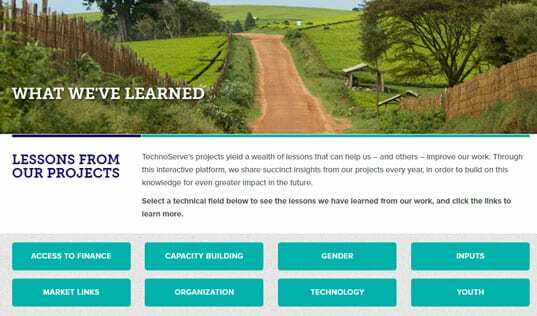 The TechnoServe team identified and replaced missing or broken parts, and conducted pilots using water to ensure that the machinery operated properly. Volunteer experts in quality, research and development from General Mills are currently developing three types of yogurt formulas to be produced using the updated yogurt processing line. Since participating in the SAFE program, Rut & Hirut has experienced a 216 percent increase in revenue from the sale of pasteurized milk, cheese and yogurt. And the shelf life of Rut & Hirut’s milk increased from three to seven days after following the advice to chill the milk during transport. Farmers are also reaping the benefits, with increased prices for the milk they are supplying. Hirut has not only been striving to make a difference in her community, but also in the country’s entire dairy industry. After writing a letter to the Bill & Melinda Gates Foundation about the poor quality of local cattle breeds, Hirut has become a spokeswoman for the necessity of artificial insemination across the entire country. “One day, they showed up and said, ‘you asked for artificial insemination.’ I said, ‘I asked for all of Ethiopia, not just for me!’” Hirut has since spoken at multiple events, even traveling internationally to spread the word for the need of improved cattle breeds in Ethiopia. Hirut’s work doesn’t stop there. Rut & Hirut recently gained word that they will be the recipient of a $268,255 grant provided by USAID’s Agricultural Growth Program-Livestock Market Development to acquire a chilling tank that will expand capacity from 3,000 liters to 7,000 liters per day, providing a market opportunity for over 700 milk producers in Chacha.